New item in original packaging. Air Force badge regulation size mirror finish Basic Civil Engineer Readiness. 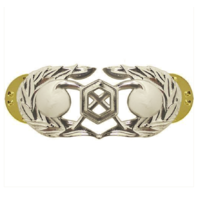 Authorized in 1993 and awarded to officers and enlisted personnel in the civil engineer field. Individuals in this career field who are also qualified in the EOD career field may wear the appropriate EOD badge. Individually priced.